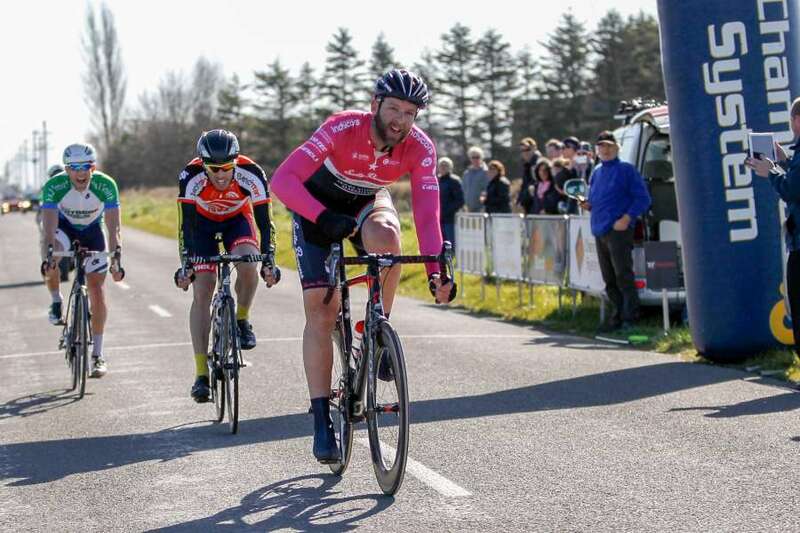 Former Commonwealth Games representative Jason Allen seized the leadership opportunity on offer with his cycling team today, stepping up and winning the elite race of the fourth round of the Benchmark Homes Elite Cycling Series near Ashburton. In recent years Allen has ridden in a support role for his Scotty Brown Racing’s leaders Sam Horgan, Robin Reid and Michael Vink, but with these riders not racing Allen made the most of his opportunities, making the days key break of 25 riders that was eventually whittled down to four that contested the finish, and then beating Dan Barry (Tasman Wheelers) and Luke Macpherson to win the 133 kilometre race in three hours and seven minutes. Macpherson attacked with less than two kilometres remaining forcing Allen’s team mate in the break Reon Nolan to chase and close it down, Allen then timed his final lunge for the line perfectly to claim the win. Auckland based former national champion Gordon McCauley had his first taste of elite racing since breaking his leg in February, performing well to finish twelfth after a puncture within the first five kilometres caused some panic and forced an early chase to get back into the main peloton. McCauley said he was ‘really happy and comfortable’ with how he felt, thinking he was ‘one of the strongest guys in the main peloton,’ happy he remains on track for his twenty second SBS Tour of Southland in November which was in serious doubt earlier this year. Like McCauley, winter and summer double Olympian, 47 year old Chris Nicholson, (Tasman Wheelers), is old enough to race in the masters grade, but after potentially fatal cardiac arrest late last year he continues to rack up impressive elite cycling results, including winning the chasing bunch sprint to claim an impressive fifth. The masters 107 kilometre race also saw a successful breakaway contest the finish with Dunedin’s Justin Stott from (Cycle World) beating Ian Smallman (Team Thule Cycling), Peter Murphy (Warmup Cycling Team) and Smallman’s teammate Matthew Talbot in a sprint finish to win in two hours and 34 minutes. In similar fashion to the elite men’s race, Smallman, racing in the masters 35 to 44 age group classification, attacked with less than two kilometres remaining only to be hauled back in by Murphy with Stott and Talbot tucked in behind the Gisborne rider. Stott, who has ridden in a Tour of Southland team with Murphy, and is again this year, started his sprint with 250 metres to go, coming out from behind Murphy to claim victory with Smallman having to settle for second and Murphy coming third. With all four leading masters contesting the 35 to 44 year old age group attention turned to an important bunch sprint that was narrowly won by Darrell Kircher who edged out his Armstrong Subaru team mate Craig Domigan to finish fifth, but more importantly, win the 44 to 49 year old classification. Brent Marryatt (Sport Canterbury Racing) finished third in the bunch sprint and seventh overall to win the over 50 classification. Hasting’s Kerri-Anne Page (Benchmark Homes) won her first Benchmark Elite women’s race in impressive fashion, getting away with over a lap to go to win by one minute in just over three hours. Nelson’s Karen Fulton (Tasman Wheelers) won a large bunch sprint to claim second, narrowly beating Sharlotte Lucas (Benchmark Homes), Renee Wootton (H&J's Outdoor World Avanti+) and Lydia Rippon (Cycle World Fairweathers). Photo credit; rickoshayphotos; Jason Allen (Scotty Brown Racing) wins today’s fourth round of the Benchmark Homes Elite Cycling series near Ashburton.